A simple pulled pork recipe that enhances the flavor of the meat without masking its true taste. Just 3 added ingredients but results in moist and delicious pork. 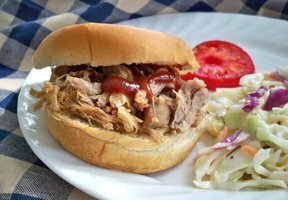 These pulled pork sandwiches are great to serve at your Memorial Day get-together and are perfect for a graduation open house. Let us help you plan your special graduation open house party with tips on everything from sending invitations to planning a menu that fits your needs. See step-by-step instructions on how to set up your grill for direct heat grilling versus indirect. Learn when to use each different method.